"A crisp and refreshing jicama salad, this salad goes really well with any Mexican or Asian dish." 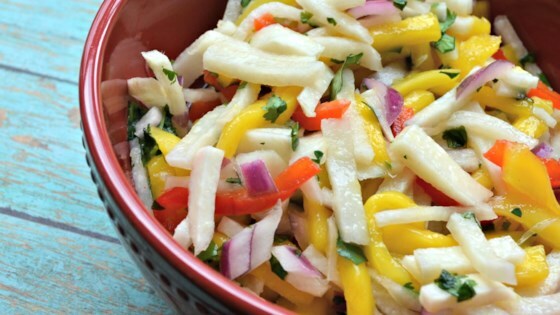 Toss jicama, red pepper, mango, and red onion together in a large bowl. Set aside. Stir cilantro, lime juice, honey, salt, and cayenne pepper together in a bowl. Pour the cilantro mixture over the jicama mixture and toss to coat. Cover the bowl with plastic wrap and refrigerate for at least 15 minutes. See how to make a quinoa salad with dried cranberries. Make sure that the mango is very firm so that it is easily julienned. Made it for dinner tonight. Hate to be the only one who rates it less than 5 stars, but, we thought that it was just OK. I probably won't make this again. i made this yesterday it was refreshing and delicious. my husband said it's a keeper. I loved this salad, so fresh and tasty with just the right amount of hot punch. First time I ate jicama too, will make it again adding some apples and cucumbers. This is delicious! I used only a tablespoon of honey and chipotle instead of cayenne. YUM!! !